Ocean Colour Scene. DO YOURSELF A FAVOUR >< Paul Weller. WILD WOOD >< Ocean Colour Scene. THE RIVERBOAT SONG >< Ocean Colour Scene. THE DAY WE CAUGHT THE TRAIN >< Ocean Colour Scene. THE CIRCLE >< Ocean Colour Scene. HUNDRED MILE HIGH CITY >< Ocean Colour Scene. DEBRIS ROAD >< Ocean Colour Scene. PROFIT IN PEACE >< Ocean Colour Scene. JULY >< Ocean Colour Scene. 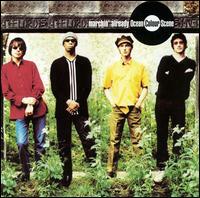 UP ON THE DOWNSIDE >< Ocean Colour Scene. YOU ARE AMAZING >< Ocean Colour Scene. WE MADE IT MORE >< Ocean Colour Scene. GIVE ME A LETTER >< Ocean Colour Scene. CAN’T GET BACK TO THE BASELINE >< Ocean Colour Scene. SECOND HAND CAR >< Ocean Colour Scene ft Linda Thompson. SHE’S BEEN WRITTING >< Ocean Colour Scene. 100 FLOORS OF PERCEPTION >< Ocean Colour Scene HARRY KIDNAP >< Ocean Colour Scene. MAGIC CARPET DAYS >< Ocean Colour Scene. SATURDAY.